The horrors of the Green Horde are shuffling ever-closer to the launch of the Kickstarter campaign on May 30. The hotly anticipated sequel to Zombicide: Black Plague has had an interesting journey to get to this point. In many ways, the latest Zombicide offering is the cumulation of all of the games in the series that came before it. “Green Horde is the heir to the whole Zombicide series, and benefits from the experience acquired along the way. The core mechanics stay the same from one box to the next, and the identity comes from extra rules,” said Raphael Guiton, one of the designers of the Zombicide series. With Black Plague being such a big hit, the designers always knew they would create a sequel, but they wanted to take their time with the design and ensure a fresh and new experience for fans. With Green Horde, Guiton really wanted to introduce a unique challenge to the players. But it wasn’t simply about the foes they would face. This game thrusts the Survivors into a wild new setting, rich with its own history of battle. Returning to the Zombicide series always feels like coming home for Guiton and the rest of the team. They cut their teeth on Zombicide and they approach each new game with a sense of pride. When designing a new standalone game in a long running series, the goal is a balance between offering something new to existing fans, but also remaining a point of entry for new players. Guiton thinks they’ve managed to do it with Green Horde. So what does he think people will like the best? “Players will love facing new challenges while using both old and new rules. Hedges and flooded zones introduce deep changes in the gameplay, as Survivors can play hide and seek with zombies. Orc zombies, on the other hand, hit harder, or spawn in greater numbers in the specific case of Orc Runners. Players must adapt their strategies accordingly. Green Horde also introduces the Trebuchet, allowing survivors to perform artillery strikes around the board. It’s a great system to create new quests and use new strategies,” Guiton explains. Guiton and the rest of the team dedicated a lot of their time to making sure the miniatures in Zombicide: Green Horde looked just right, noting how important they are for making players care about the game they’re playing. It’s tough for Guiton to pick out one specific iteration of Zombicide as his favorite, or even to choose between the modern and medieval settings. With so much love for the different games in the series, we were curious what Guiton thinks are essential elements in a horror game. It’s clear that, for Guiton and the rest of the team, Zombicide is like a part of the family, and Green Horde is the newest member. The goal was to come up with a game that benefited from the history of the series, and yet was still accessible for new players. Fans will get their first chance to face off with the Green Horde when it launches on Kickstarter on May 30. Read about the Real History of the Black Plague here. 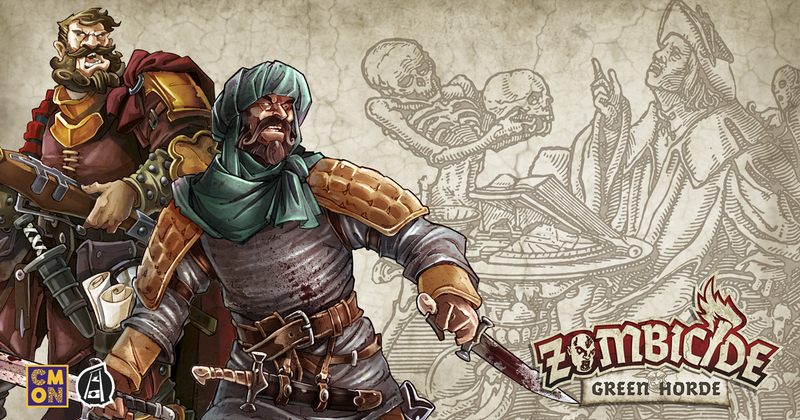 Read our Zombicide: Green Horde Overview here. Read about the Heroes of Zombicide: Green Horde here. Read about the New Zombies of Green Horde here.